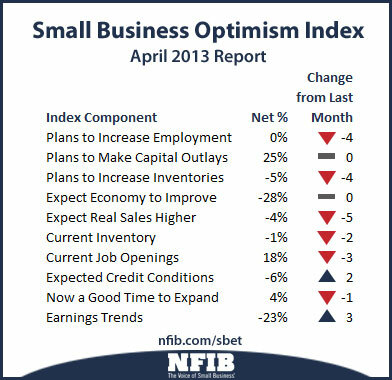 WASHINGTON, April 9, 2013 – After three months of sustained growth, the March NFIB Index of Small Business Optimism ended its slow climb, declining 1.3 points and landing at 89.5. In the 44 months of economic expansion since the beginning of the recovery in July 2009, the Index has averaged 90.7, putting the March reading below the mean for this period. Of the ten Index components, two increased, two were unchanged and six declined. Among the greatest declines were labor market indicators, inventory investment plans and sales expectations. and energy in particular). A near record low percentage of small-business owners claim that credit is their top business problem (three percent); the greatest business problem for 23 percent of owners is taxes and regulations and red tape for 21 percent of owners. • Job Creation. Job creation in the small-business sector was perhaps the only bright spot in the March report. The fourth consecutive month of positive job growth, owners reported increasing employment an average of 0.19 workers per firm in the month of March. This is the best reading NFIB has recorded in a year. • Hard to Fill Job Openings. For the 47 percent of owners who hired or tried to hire in the last three months, 36 percent (77 percent of those trying to hire or hiring) reported few or no qualified applicants for open positions. • Sales. The net percent of all owners (seasonally adjusted) reporting higher nominal sales over the past three months was negative 7 percent, an improvement of 2 points and the best reading in eight months. However, firms are still reporting more declines than gains. Seventeen (17) percent of small employers cite weak sales as their top business problem, a one point improvement over February. • Earnings and Wages. Reports of positive earnings trends improved 3 points in March, but landed at a negative 23 percent—a very poor reading. However, a seasonally adjusted net 16 percent of owners reported higher employee compensation (up 2 points from last month), which is good news for employees. • Credit Markets. Credit demands remained weak in March. Twenty-nine percent reported all credit needs met, and 49 percent explicitly said they did not want a loan (64 percent including those who did not answer the question, presumably uninterested in borrowing as well). Seven percent of owners surveyed reported that all their credit needs were not met, unchanged from February and 3 points above the record low. • Capital Outlays. When it comes to business investment, owners are still in “maintenance mode.” The frequency of reported capital outlays over the past six months rose 1 point to 57 percent, rising steadily since January, though by very small amounts. The percent of owners planning capital outlays in the next three to six months was unchanged at 25 percent. • Good Time to Expand. Only four percent of owners surveyed characterized the current period as a good time to expand facilities (down 1 point), and historically a very weak number. The net percent of owners expecting better business conditions in six months was a net negative 28 percent, unchanged from February but 7 points better than December). These readings are among the lowest in the 40 year history of the NFIB survey.